About 10-11 years ago my friend and fellow S12 guy Henge had a 1987 SE V6 that got rear-ended. Eventually a mutual friend and I bought the car, with me getting the engine and transmission and him getting the rest. I had no place to put the engine so he stored it for me and we lost touch. 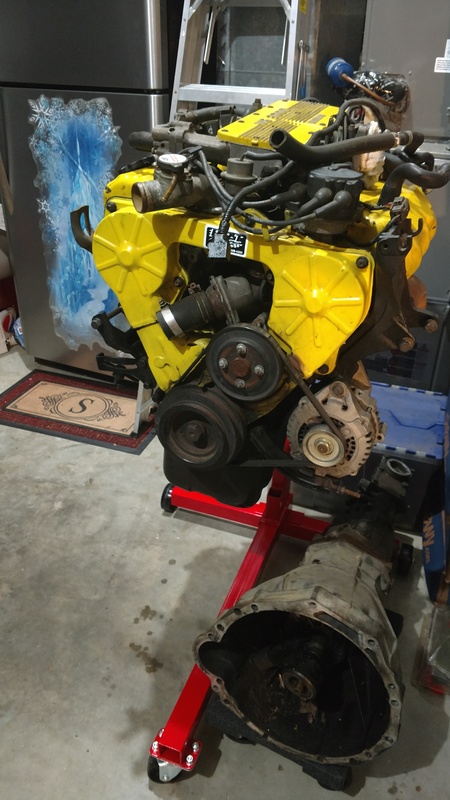 Recently Henge helped me get back in touch with him, and now my spare VG30E and transmission are safe in my garage! I plan on getting my SE back on the road with the current engine and transmission, but it sure is nice to have spares. It really ups the coolness factor of my garage, too. Looks good next to the Disney Frozen fridge decal. Congratulations on being reunited. Slow build VG33 hybrid??? ?